Our vision is for a Green New Deal to be based on public ownership and democratic control of industry. It will build solidarity across borders to internationalise our ambitions. It will include the comprehensive provision of universal basic services to meet everybody’s needs – from food to health and childcare to education and transport – and act as a foundation from which to collectively build a prosperous new society. To achieve these aims, we need to quickly ensure the Green New Deal is high up on the Labour Party’s agenda. Our campaign’s first step is to circulate model motions for supporters to pass through their branch and CLPs. We want to display a groundswell of grassroots support for the program spanning the UK. Then we will build towards arguing for a transformative Green New Deal at party conference 2019. It’s no coincidence that the best climate solutions assure workers’ justice. The elite interests which have pushed the climate to the brink, squeezed wages and eroded workers’ rights are one and the same. The Green New Deal provides a framework for a radically different kind of society, with massive investment in green re-industrialisation and upgrading infrastructure across the economy to fully decarbonise while guaranteeing a well-paid, unionised job for all. A Green New Deal in the UK is therefore nothing without participation and leadership from our unions. Rank-and-file trade unionists across the country are ready to organise for this from below. We’ll work with them to build support, host events, pass motions from branches to policy conferences, and develop regional plans for a Green New Deal that put workers first. 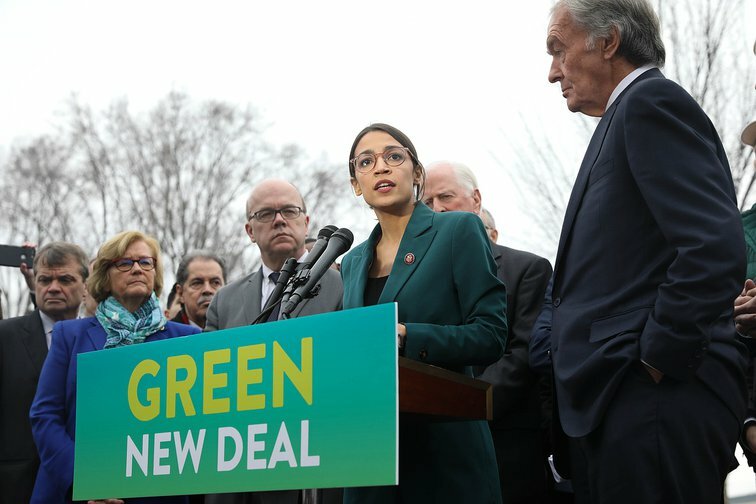 In the US, support from Senators and Members of Congress has kept discussions around the Green New Deal in the mainstream. Here, we will support activists to lobby their MP and parliamentary candidates to publicly back our Green New Deal. Working with city and county councillors, local party members will develop plans for implementing municipal Green New Deals under a Labour government. Almost a decade of Tory rule has starved councils of resources to take necessary climate action, but councils must be ready to deliver radical measures when Labour comes to power. We will provide members with toolkits to host events in their towns and cities across the country. Many events are already planned from Bristol to Manchester to Newcastle. These will be vital entry points for Labour and union members to begin organising for a Green New Deal from the regions the campaign seeks to re-empower. They will also act as spaces for regions to discuss and propose what they need out of a Green New Deal. Campaign strategists, think tanks and politicians can take us only so far. It’s the workers and communities that will benefit most from a Green New Deal who have the most to offer in developing our platform. We are building a resilient, lasting organisation to facilitate organising for climate and social justice in the labour movement. Organisational questions are often subordinated to political ones. For Labour for a Green New Deal, getting them right is vital to underpinning a successful political campaign. We draw inspiration from trade unions and the Labour Party which have stood strong in the face of an onslaught of attacks from neoliberal governments and a legacy media laden with ruling class interests. Using big organising methods, we will maintain structures of accountability while fostering leadership locally and nationally. We are socialists and trade unionists; workers and unemployed; housing, anti-racist, anti-fascist, environmentalist, health, international solidarity and feminist activists. Together we will organise for Labour to lead on addressing the greatest social and ecological challenges of our time. Join us. Chris Saltmarsh is Oxford Labour's youth officer.